Zillow has rolled out a new “coming soon” feature that allows agents, brokers and multiple listing services to market homes on its site up to 30 days before they hit the MLS. The feature is restricted to agents who advertise with the portal and the brokerages and MLSs who provide Zillow their listings in a direct feed. “Coming soon” listings do not feature ads for agents other than the listing agent. Agents can manually upload their coming soon homes to Zillow while brokerages and MLSs can opt in by adding a “Coming Soon” field to their current feeds or building out a separate, new feed dedicated to coming soon listings. Agents can renew a coming soon listing for up to 30 additional days. The feature allows a listing to land on the MLS with a “ton of velocity” with buyers dreaming home-specific dreams and ready with preapproval letters from lenders, Zillow Chief Revenue Officer Greg Schwartz told Inman News. In addition to driving up the number of agents who advertise with the portal and the number of brokerages and MLSs who send it their listings directly, Zillow added the new feature because it saw a need for a premarket category in its ecosystem, Schwartz said. Zillow frequently sees listings posted to Zillow’s site before they hit the MLS, and this feature puts a framework around the practice on Zillow, he said. The feature will “shine a bright light on pocket listings,” he added. Pocket listings — whereby agents market, and sometimes coordinate the sale of, listings outside of the MLS — are becoming increasingly prevalent in the real estate industry. A recent study by CoreLogic suggested that nearly 50 percent of homes sold last year were sold outside of the MLS. Zillow’s new coming soon feature puts pocket listings on steroids, giving them exposure on the most-visited real estate site in the U.S. In April, Zillow attracted 45.1 million unique visitors to its site from mobile devices and desktop computers, according to comScore. In some cases, listings kept off the MLS increase the odds that agents can represent the buyer as well as the seller of one of their listings, a situation known as dual agency. While there is debate about whether dual agency is detrimental to buyers and sellers, Inman News columnist Teresa Boardman has pointed out that some sellers can negotiate lower agent commissions when deals occur out of sight of the MLS. Some MLSs have instituted policies that forbid premarketing of listings, while others have added their own “coming soon” status on their platforms, albeit with the caveat that such listings can be marketed only to fellow MLS members and not the general public. To ensure that agents who upload coming soon listings to Zillow are on the right side of industry policies, Zillow requires agents to check a box that certifies that by uploading the ‘coming soon’ listing they are complying with the rules and regulations of their local MLS, local association of Realtors, their brokerage and their state’s licensing laws. Agents also certify that they have their seller’s permission to market the home before putting it in the MLS. 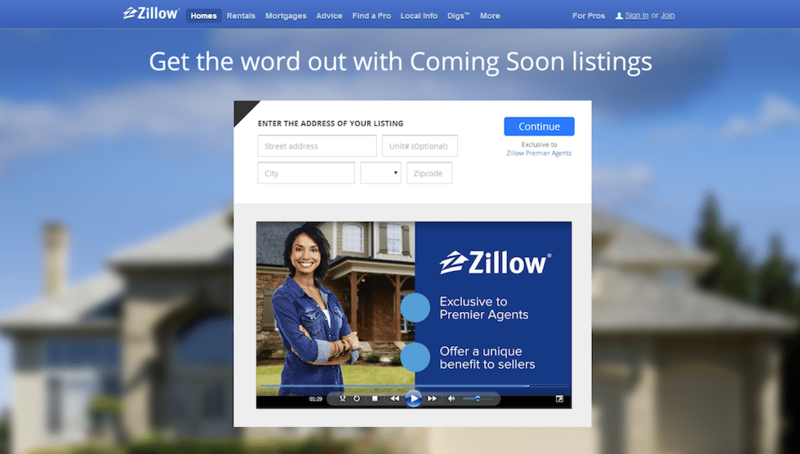 Zillow requires agents to verify that they comply with MLS and/or local Realtor association rules each time they upload a “coming soon” listing to Zillow. For example, if an MLS requires agents to enter a home in the MLS within 48 hours of signing a listing agreement, that listing would only be able to be on Zillow as a “coming soon” listing for that time period legitimately, Schwartz said. “We fully expect all ‘coming soon’ listings on Zillow to hit the MLS,” he added. 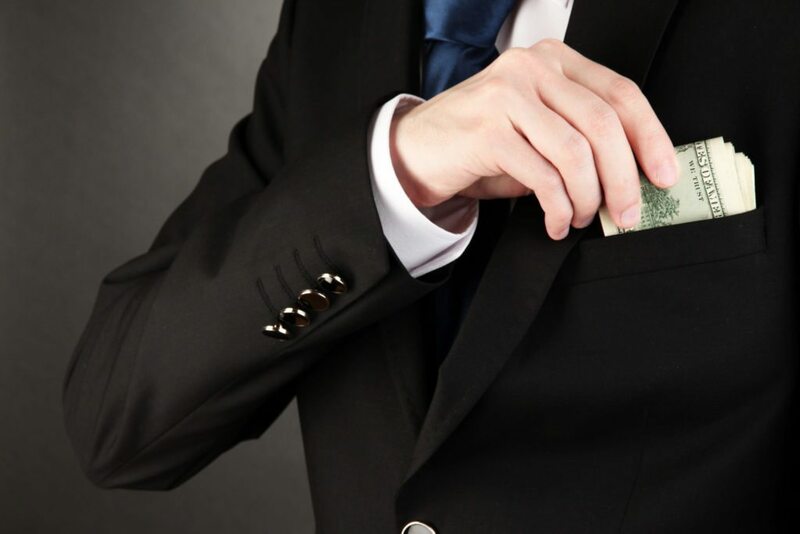 Zillow retains an audit trail for each “coming soon” listing that goes on agents’ permanent record at Zillow, so if there’s ever an issue about breach of an MLS, broker or state real estate policy with this new Zillow feature, there’s a way to verify that, Schwartz said. MLSs and brokerages agree to the terms of the Zillow “coming soon” listing requirements — that they have the right to market the listings and are complying with rules/regulations — in their direct feed agreement, Zillow spokeswoman Amanda Woolley said. By premarketing their listings on Zillow, listings also avoid the ticking days-on-market clock that starts when a listing hits the MLS, Schwartz said. Listings that languish for a long time on the market can carry a stigma that pushes some buyers away. Agents can also change the price of the premarketed home and monitor page views over time from their “Agent Hub” dashboard on Zillow, Schwartz said. Agents also receive a stand-alone report every two weeks by email that breaks down the performance of their “coming soon” listings on Zillow. 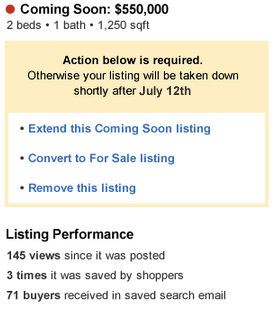 Screen shot of a sample Zillow “coming soon” report sent to agents biweekly. As soon as a “coming soon” home hits the market, Zillow removes the “coming soon” info from the site and it shows up as a typical Zillow listing, Schwartz said. If the “coming soon” listing is part of a feed from brokers or MLSs, this change will occur automatically. If not, the agent must update that manually or Zillow will if it detects a home with the same address has been listed for sale. A “coming soon” listing requires a minimum set of information. It needs at least one photo, an address, a description, a price and a date when it’s set to hit the market, Schwartz said. 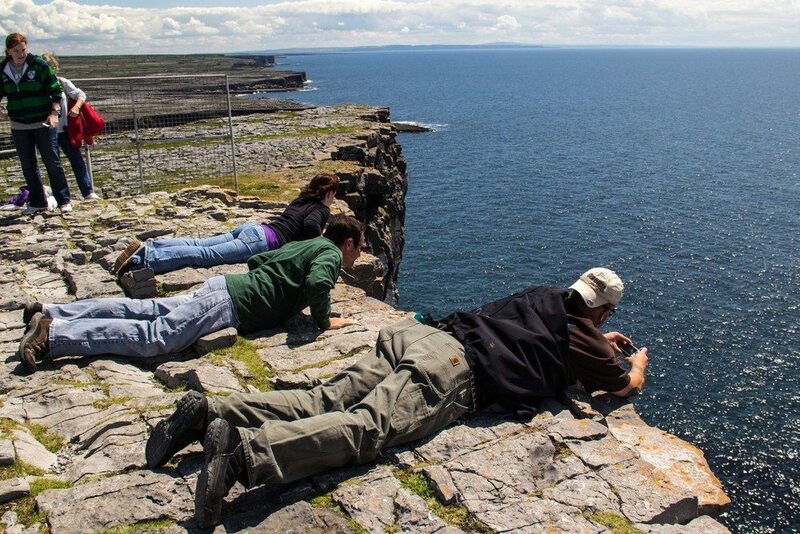 Agents can add unlimited photos and additional details if they wish. The “coming soon” listings will show up much like regular for-sale listings on Zillow with some notable differences. No ads from competing agents will show up on the property detail page, just listing agents’ branding and a contact form that directs leads to them. No competing agent ads show up on the property detail page of “coming soon” listings. Listing agents’ branding and a contact form that directs leads to their way are on the pages instead. “Coming soon” listings also include the Zillow data that shows up on regular for-sale listings on the portal, including Zestimates, price history, tax information and more, Schwartz said. 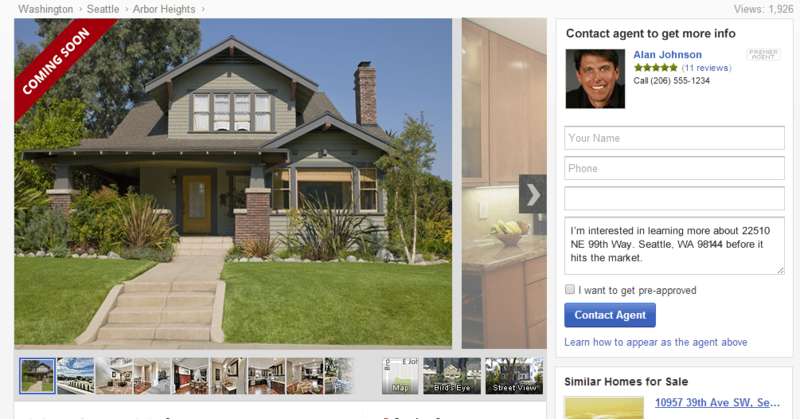 Consumers can also now filter their home searches on Zillow with the new “coming soon” category. On the search results page, “coming soon” Zillow listings will automatically show up above all others in the list view for the market the consumer is looking in. The “coming soon” listings will show up in map view as red dots on Zillow, just as for-sale listings do. However, when consumers click on them, the home details clearly label the listing as “coming soon” with a date that declares when it’s set to hit the market. Zillow rivals Trulia and realtor.com declined to comment for this story.